feast of Blessed Jeanne Jugan - Foundress of the Little Sisters of the Poor. This was the day the Mother Foundress of the Little Sisters of the Poor died (in religion, Sister Mary of the Cross). This was the day the Sunday readings called us to take up our cross and follow Christ. 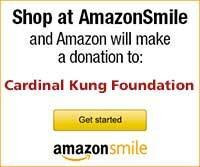 This was the day Cardinal Kung came to Queens Village. It all began with an article in the NATIONAL CATHOLIC REGISTER relating the heroism of Cardinal Ignatius Kung, who had valiantly shouldered the cross of imprisonment and suffering in China to remain faithful to the Roman Catholic Church. The newspaper told of the release of the bishop of Shanghai at the age of eighty-eight and his retirement in Connecticut. We started to make some connections: "That is the bishop who gave wise counsels to our Little Sisters in China years ago...who was a true spiritual father for them. Mother General went to meet him in Paris when he was able to come there with his nephew." As the connections were made, the excitement grew. "Here he is", we thought, "a martyr for the faith to whom the universal Church in general and we Little Sisters in particular have such a debt of gratitude - so close by, in Stamford, Connecticut! He is 92 years old now. We should make a contact to express our gratitude before it is too late..."
No sooner had we formulated these ideas than an invitation arrived to attend a golden jubilee celebration for Father Charles Repole, OFM, in Stamford. What was more, it turned out that Cardinal Kung was a friend of Father Charles and would be at the jubilee too! The deep joy of meeting this venerable prelate on that occasion was surpassed only by the joy of having him accept our invitation to come to Queens. The novices began studying about our Chinese foundations in their history of the Congregation classes. They learned of the role that the bishop of Shanghai (Cardinal Kung) had played in guiding our little Sisters. The Residents took up a collection for the Church in China. The family of the Cardinal made arrangements for his transportation and his celebration of Mass for us. Father Charles drove to Brooklyn to bring Father Xavier Tsai, SJ, to concelebrate with the Cardinal. Everything was falling into place. On August 30, His Eminence was warmly welcomed by the elderly Residents of Queen of Peace, the novices and the Little Sisters, who were awed by his serenity and amazed at his agility at 92, after having endured 30 years of forces labor and psychic pressure. Mass followed immediately: a most impressive reenactment of the mystery of the cross and resurrection of the Lord by his very close followers. Cardinal Ignatius Kung was the principal celebrant. The texts were in Latin. Reverence reigned. Frances and Henry, faithful volunteers at Queen of Peace and Jeanne Jugan Residence in the Bronx, provided the music as the older generations sang the Latin responses with relish and the novices, with effort. 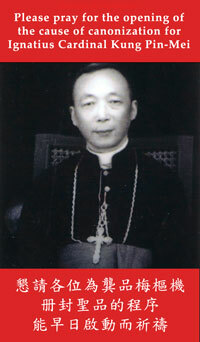 Father Xavier Tsai, SJ, who was among the five concelebrants, had been a prisoner for Christ for 35 years. He was released in 1988 and is now 89 and working in Brooklyn to preach the Gospel message of love and forgiveness. Also present was Philomena, a former employee of our Home in the Bronx. She too had born the cross of imprisonment in China. Her crime had been membership in the Legion of Mary. The Liturgy took on added meaning when shared with these modern martyrs. The cross of Christ was exalted by their peaceful presence. The hymn, "Faith of our Fathers," was sung with more emotion than ever. After Mass, Msgr. Horgan, an elderly priest who resides at Our Lady of the Clergy Retirement House with Cardinal Kung, and who serves as his English-French interpreter, read an address that had been carefully prepared by the Cardinal to express his joy at being once again with the Little Sisters and their Residents. During the recessional, the Cardinal passed through the congregation, blessing us all in a fatherly way. Father Charles was just beaming to see the enthusiasm on everyone's face. Many of the Residents followed the venerable prelate out of the chapel to kiss his ring or just "to touch such a holy man." Having fasted from midnight, the Cardinal seemed to enjoy the breakfast that was served after Mass in the auditorium. He was evidently pleased to be in the company of the Little Sisters, his family, and his fellow prisoners of conscience. During this little reception. we were spellbound as the Cardinal's 16-year old grandniece masterfully executed a piano piece from memory. We were amused when Msgr. Horgan gave an animated rendition of the "Marseillaise." We were compelled to join in as Father Charles sang, "Make Me A Channel of Your Peace." But we were touched most of all when the Cardinal sang from the depths of his heart the Chinese anthem to Our Lady of She-Shan (the national Marian shrine in China that is located in his diocese and is now occupied by the Patriotic Church). Father Tsai sang the refrains with the Cardinal. The Cardinal stood up to present Mother Cecilia Mary, superior at Queen of Peace, with a picture of Our Lady of She-Shan as a souvenir of this day and a reminder to pray for China. This reception, which was like a family reunion, brought to a close the visit of Cardinal Kung. As we accompanied him to the car, he bade us farewell saying, "Rendez-vous au ciel" ["See you in heaven"]. So we sang a French hymn about heaven while we walked. When we reached the curb, the Cardinal's niece whispered to him: "Let's leave with a Salve Regina" - so His Eminence intoned the well-known melody and we all joined in. He sang with his eyes cast down in recollection until the last line when he raised his head and one hand, as if to hail his heavenly Queen: "O clemens, O dulcis Virgo Maria!" His eyes gazed heavenward and many of our eyes filled with tears. With that, he waved warmly to us all, leaving a lasting impression of a man of God, a martyr for the faith, a follower of Christ whose cross bearing had marked him with peaceful serenity. This anniversary day of the death of our foundress, Sister Mary of the Cross, was indeed an exaltation of the cross.